The key question about the result of the June 26 Spanish general election is also the most difficult to answer: why did 1.09 million people — who in the December 20 elections voted for the anti-austerity party Podemos, the United Left (IU) and the three broader progressive tickets Together We Can (Catalonia), Podemos-Commitment (Valencian Country) and In Tide (Galicia) — not vote for the combined Podemos-IU ticket (United We Can) and these broader tickets at this poll? The election recorded a greater vote for the ruling right-wing People's Party (PP). The social-democratic Spanish Socialist Workers Party (PSOE) also held off the seemingly unstoppable charge of United We Can and its allies towards supplanting it as the leading force of the left. Nonetheless, the resulting alignment in parliament, although now more favourable to the PP, is still deadlocked. Just as after the December 20 poll — after which the failure to form a government led to the June 26 replay — no majority is readily available. A PSOE-United We Can or PSOE-Citizens government (Citizens being a newer “hipster” right-wing party) is more unlikely than ever. However, a PP-led government cannot be formed without either the PSOE or Citizens breaking election campaign commitments not to support it. PSOE said it would not support a PP government on any condition, while Citizens said it would refuse to support a government led by PP's acting-prime minister Mariano Rajoy. In December, the total vote for Podemos plus IU and the broader tickets was just under 6.14 million: on June 26 the same forces could only muster 5.05 million votes. Their percentage score fell from 24.36% to 21.1%. The seats won by these forces remained unchanged at 71. But the combining of the December Podemos and IU vote into a single result should have harvested an extra 17 seats (under the Spanish system of uneven-sized multi-member electorates). In effect, United We Can lost 17 seats. The disappearance of these million-plus left votes was also the most important factor in determining the overall result of June 26. It meant, firstly, that the overall left-right balance of the all-Spanish parties shifted to the right. The PP's 7.868 million votes (33.03%) plus the 3.107 million votes (13.05%) for Citizens gave them 10.975 million in total (46.08%) and 169 seats in the 350-seat Spanish parliament. By contrast, the total broad left vote (PSOE, United We Can, and its allied coalitions) was 10.432 million (43.78% and 156 seats). Secondly, it meant that the PP-PSOE traditional two-party duopoly, wounded but not destroyed in December 20, recovered a little. The vote for the old parties rose from 50.71% to 55.69%. For new parties (United We Can plus the broader convergences plus Citizens) fell from 38.3% to 34.15%. Thirdly, it meant that United We Can and its allies fell well short of overtaking the PSOE, both in votes and seats. If the missing million-plus had supported United We Can, the biased Spanish electoral system would still have given the IU-Podemos ticket 88 seats for its 6.14 million votes as against the PSOE's final result of 85 seats for 5.403 million votes. As it was, the PSOE, despite its own loss of five seats, ended up with 14 more seats than United We Can and its allies. The vote for nationalist parties (left, centre and right) fell slightly, from 7.03% to 6.94% (down 113,000 votes). This reflects that most socially conservative voters in Catalonia prefer the PP over the Catalan right-nationalist Democratic Convergence of Catalonia (CDC). In total, the seats held by Basque, Catalan and Canary Island nationalist parties fell from 26 to 25. The right-nationalist Basque Nationalist Party (PNV), ruling in the Spanish Basque Country, lost a seat to United We Can. The all-party right-left balance (including nationalist forces) is now 52% to 48%. If CDC — in open warfare with the all-Spanish right over Catalonia's right to decide — is excluded, the right-left balance is 50.9% to 49.1%. If the PNV is also excluded the result is 50.2% to 49.8%. However, this balance has moved against the right in Catalonia. Left forces supporting a Catalan right to decide — Together We Can plus the Republican Left of Catalonia (ERC) — now account for 42.68% of the vote, up from 40.7% on December 20. This totally unexpected result went against all opinion and exit poll forecasts. Their average over the final fortnight of polling predicted 25.4% for United We Can (4.3% more than its actual result), while the PP vote was supposed to stay stuck on 28.7% (4.3% less than its actual result). 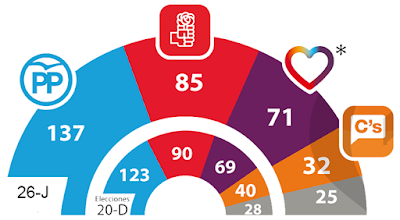 Only the forecasts for the PSOE and Citizens were roughly accurate (within a percentage point). The election campaign was, in essence, a referendum on whether Spain wanted a United We Can-led government of the left. The PP, PSOE and Citizens were in furious competition as to who could put the “No” case most vehemently. The PP, presenting itself as the only reliable bastion against chaos and extremism, easily won that contest. Its vote rose from 28.72% to 33.03% as it took seats from both Citizens (down eight) and the PSOE (down five). It picked up seats in its long-standing heartland regions Castilla-La Mancha and Castilla y Leon. But its vote also rose in three regions where corruption had been rampant under its administrations — the Valencian Country, the Madrid region and Galicia. In each of these regions, where progressive “councils for change” have been in power in their capitols since May last year, the PP regained two seats. It also picked up seats from the PSOE in the PSOE heartlands Andalusia and Extremadura, as well as in the Canary Islands and Catalonia. After December 20, the PP was the lead party in 39 of Spain's 52 electoral districts: now it is the lead party in 42, having overtaken the PSOE as the lead party in Andalusia and Extremadura. Clearly, hundreds of thousands of voters who had flirted with Citizens and the PSOE on December 20 felt that the serious work of turning back the “red menace” was best entrusted to the experienced PP professionals directly, descended from Franco's fascist dictatorship. The biggest victim of the fearful tide of return to the PP was Citizens — seven of the eight seats it lost were taken from it in PP strongholds. This outcome gives an insight into the mentality of the PP support base. The party is mired in endemic corruption and permanent scandals. Its lead candidate in Catalonia (acting attorney-general Jorge Fernandez Diaz) was revealed days before the election to have conspired with the Catalan anti-fraud commissioner to get dirt on Catalan pro-independence political leaders. The result? If “reds” and “secessionists” have to be stopped, we will reward the PP with a higher vote, irrespective of other factors. In Catalonia, the PP vote went up from 11.12% to 13.36% — 44,300 voters added their support to the party of what is now being called “Fernandezgate”. The PP's other victim was the PSOE. The Spanish social democracy tried its best to perform as more anti-Podemos than the PP, especially in Andalusia and Extremadura. But voters frightened by the thought of a United We Can-led government unsurprisingly rejected the PSOE's low alcohol anti-communism in favour of the PP's stronger original brew. The PSOE's election message was that it would never accept being a junior partner in a United We Can-led government, yet was totally evasive as to what it would accept. This ambiguity was successful to the extent that it contributed to demoralising potential United We Can voters and robbing United We Can of momentum. However, the gain came at a cost. The PSOE lost six seats and gained one, a net loss of five representing 120,000 fewer votes. Five of its lost seats went to the PP and one to United We Can (in Sevilla), while its one gain came from United We Can (in Madrid). As a result, the gap between the PSOE and the PP widened from 33 seats to 42. It is no longer lead party in any of Spain's 17 autonomous communities (states). The PSOE's lead over the forces to its left has also closed, from 19 seats to 14. However, notwithstanding these setbacks, the PSOE won its key battle on June 26. It prevented United We Can from overtaking and putting it in a subordinate position on the left — and potentially on a path to irrelevance like that of its Greek sister-party PASOK. Its war for left hegemony with United We Can now continues — most probably in opposition to a PP-led government. •	In 10 of the 52 electoral districts, the vote for United We Can was less than the vote for Podemos alone on December 20. This trend was most marked in the Canary Islands, but also appeared in PP strongholds like Murcia and parts of Castilla y León. In addition, the inclusion of the Valencian affiliate of IU in the Podemos-Commitment coalition and of More For Mallorca in United We Can on the Balearic Islands failed to bring any rise in the vote in those regions. •	In only four provinces did the United We Can vote exceed the combined December 20 vote of Podemos and IU — examples of the positive gain from unity that had been hoped for across the entire Spanish state. They were the Basque provinces of Alaba, Biskaia and Gipuskoa and in the autonomous community of Navarra. The rise of Podemos in these Spanish Basque regions looks like a special phenomenon: finally the hundreds of thousands who identify as Basque and are socially progressive but are not necessarily pro-independence, have a party they can vote for as an alternative to the right nationalism of the PNV, the pro-independence left EH Bildu and the Spanish-centralist PP and PSOE. •	United We Can and the broader coalitions were the leading party in only five of the 52 electoral districts — two in Catalonia and three in the Spanish Basque Country. They came second in seven, third in 33, and fourth, behind Citizens, in seven. •	The regional results of United We Can and the allied convergences fell well below poll predictions, even where the actual result was acceptable. For example, Together We Can was regularly predicted to win 15 seats in Catalonia, but only managed to repeat its existing score of 12, losing 81,000 votes in the process. United We Can was down to win as many as 14 seats in Andalusia, but only managed to increase its tally by one, from 10 to 11. So what went wrong? That discussion is already raging inside Podemos, IU, and the left as a whole. It is generating such heat that on June 28, Pablo Iglesias, Podemos general secretary and United We Can lead candidate, called for restraint from various leading figures who had already gone public with their views on the disaster. They included Monica Oltra, deputy-premier of the Valencian Country and leader of Commitment, (who blamed the alliance with IU for alienating middle-of-the-road voters), Podemos founder Juan Carlos Monedero (who blamed the United We Can election campaign run by Podemos number two Inigo Errejon), and Open Left leader Gaspar Llamazares (who had always opposed the union with Podemos from within IU). IU leader Alberto Garzon joined Iglesias in the call to avoid “a war of organisations and knifings”, insisting that “if we had run separately, the result would have been much worse”. Garzon also claimed that IU voters as a whole remained loyal to the joint list on June 26, with the implication that most desertions had come from the Podemos side. The fact of the matter is that only a very thorough and detailed investigation of the many possible reasons for the vote fall can get discussion beyond what is now no more than an exchange of pet — or directly interested — theories. On the Politikon web site on June 28, Jorge Galindo, researcher at the University of Geneva, tried to outline some plausible hypotheses and the sort of evidence needed to prove or disprove them. •	The alienation of the middle-of-the-road voter? A possible explanation, especially as it is at the centre of the debate within Podemos over “transversality” — its appeal across different social groups. However, it is important to remember that the vote for the broader coalitions (which include both Podemos and IU regional affiliates) fell by only 165,600, while that of United We Can compared to the joint Podemos-IU vote in December fell by 924,200. The regions in which the vote rose (Basque Country, Navarra) or fell least (Catalonia, Valencia, Galicia), are those where the national question is important. It would seem that there was no trouble attracting the middle-of-the-road voter in these regions as opposed to those where Spanish-patriotic sentiment is stronger. Does that mean United We Can should have soft-pedalled its support for national self-determination in the Castilian heartlands? •	Low loyalty level of IU voters? It is postulated that some traditional IU voters felt resentment at what they are supposed to have felt as the “absorption” of IU by Podemos. There may be something in this, as it seems to have been reflected enough in PSOE internal polling for its leader Pedro Sanchez to devote a slab of one speech in praise of the Communist Party of Spain (PCE) — a key part of IU. Anecdotal polling station evidence also suggests a lower turnout in some traditional IU districts, like working-class Madrid suburbs (where United We Can lost two seats compared to the Podemos-IU in December). But the numbers involved are not large enough for it to be the major contributing factor. •	Punishment for internal Podemos conflict and failure of negotiations over government? The final result on June 26 was closer to the joint rating of Podemos and IU in March. At the time, Podemos was suffering internal divisions leading its national organisational secretary to be sacked and was being portrayed in the establishment media as perversely blocking the formation of a Citizens-PSOE government. •	Failure of the election campaign to mobilise membership? While the United We Can rallies were by far the biggest and most enthusiastic of all contending parties, the question being asked is whether the style of the campaign — largely unaggressive and feel-good — was what was needed in the face of the relentless hostility of the PP and PSOE. Did it lead to a lack of enthusiasm among Podemos and IU members (especially the young) and feed into tendencies to abstention created by the long months of frustrating and inconsequential haggle over government? •	Failure to build a new base of support beyond the addition of existing Podemos and IU voters? In one sense this is blindingly obvious — United We Can could not even hold onto existing Podemos and IU support. In another, it points to the core problem in an election atmosphere of outright warfare: the campaign's failure to project a convincing alternative to the economic, social and institutional programs of the PP and PSOE — even though the shared 50 point United We Can platform certainly contained the elements of that program. The sensation of relentless advance and success associated with Podemos has been punctured, even while the forces involved in United We Can and the broader coalitions maintain their important presence in the Spanish parliament. The entire left to the left of the PSOE — after having known only rising electoral success since the May 2014 elections for the European parliament — now faces a demanding challenge of diagnosis and correction. A reflection of that pressure is the increasingly heard call for Podemos to bring forward its next congress (“citizens' assembly”) to October. What happened on June 26 was that United We Can lost the “referendum” on whether enough people in the Spanish state wanted it to lead a left government — not enough trusted that it could or that such a government would not be problematic. The decline in popularity of Iglesias feels like a sort of rough indicator of this distrust. On June 28, Garzon produced a sober balance sheet of the election in a letter to IU members in which he reaffirmed his support for the coalition with Podemos and connected analysis of the election results with the general tasks of the left: “The new abstention, those who didn't bother to vote on this occasion but did do so in December, practically coincides with the voters lost by the coalition. An indispensable part of consolidating that hegemony will be creating the conviction that an alternative left government is possible and prepared: such will be the basic challenge of United We Can's next election campaign. As more detailed evidence comes to light as to what really happened between December and June, another important lesson will surely be increasingly drawn: that if the electoral coalitions that have attracted the votes of millions are to advance against the increasingly rabid neoliberal right, they will need to work hard at transforming themselves into organisations capable of organising, educating and mobilising the people who have placed such great hope in them.